Venice Marco Polo airport . Stunning “Swimming Air” installation floats above passengers heads. Creator Anna Paola Cibin. Venice. Anna Paola Cibin’s installation for Venice Marco Polo airport to be inaugurated 13th June 2014. 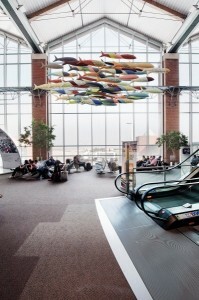 70 amazing large colourful flying fish part of the “Swimming Air” creation by Anna Paola for Marco Polo airport. Sponsored by the well known Venetian fabric manufacturer Rubelli. The fish are created in velvet repainted using unique techniques. Certain of the fish are in Murano handblown glass. A stunning flight of fish to greet air passengers as they arrive at the Marco Polo Venice airport. Venice highlighting creative art with the Venice Architecture Biennale & the famous Venice Film Festival. Brava to my friend Anna Paola, brilliantissime. Venice. 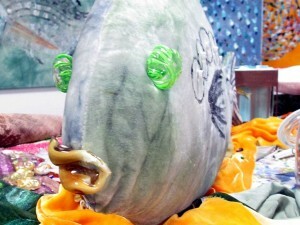 Anna Paola Cibin decorated fish part of the Swimming Air installation Marco Polo airport Venice 13th June 2014.